When you go 8-8 and miss the playoffs for the first time in five years, you overhaul the coaching staff. You look for ways to improve upon the year before because clearly, a .500 record doesn’t cut it. It doesn’t sit well. The Ravens don’t settle for mediocrity which a trait you have to appreciate from the front office. The coaching staff overhaul can only do so much. It’s still up to the players to perform. Here are three young guys the Ravens should look to, to step their games up a notch and improve in the areas that need it the most. Discuss your thoughts on this topic on our message board. Also, if you like the content you get here at BSL and want to see more of it, learn how you can help us grow while supporting four local charities here. 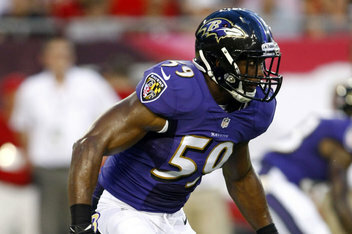 Bernard Pierce – Pierce is entering his third season on the Ravens and has played second fiddle to Ray Rice thus far. In his rookie season of 2012, he appeared in all 16 games, carrying the ball 108 times at 4.93 yards per carry. He was no slouch in the playoffs rushing for 5.18 yards per carry on 39 attempts over four games. The second year back out of Temple was off to a fast start in 2013 rushing for a 20 yard touchdown in the Ravens first preseason game against Tampa Bay. He would tweak an ankle on that same night that may have hindered him for much of 2013. On top that, the offensive line was one of the worst units in the NFL, and Pierce only rushed for 2.9 YPC last season. His opportunities went up though, getting 152 carries and 20 receptions on the season. Entering the 2014 season, Ray Rice’s legal situation is up in the air. Even if the judicial system is kind to Rice, Roger Goodell could still hand down some form of punishment. Most are expecting at least a four game suspension, mirroring the type Ben Roethlisberger got in 2010. Bernard Pierce could in fact be the starting RB for the first quarter of a season, if not more. After the disappointment that was the running game a year ago which prompted changes across the board on offense, it would behoove Pierce to make the most of his opportunity and show us he can be a feature back. Gary Kubiak has a history of churning out 1,000+ yard backs with his keen understanding and commitment to the zone blocking system. A system the Ravens pseudo adopted last year. But the commitment wasn’t there which led to much confusion and often missed assignments by the piece meal type of line. Gino Gradkowski was trying to replace a multiple time Pro Bowler at center. Left Tackle was a fiasco starting with Bryant McKinnie. But if not for McKinnie being awful, the Ravens would have never made the trade for their LT of the future, and one that fits what Kubiak’s system asks for, Eugene Monroe. A.Q.Shipley, the backup center was asked to play guard when Kelechi Osemele went down with a herniated disk. Marshal Yanda had to pick up the slack of Gino to his left, and Michael Oher, who really never lived up to the first round pick billing to his right. Monroe is back with an extension. Osemele appears to be at 100% health working out at the facility. 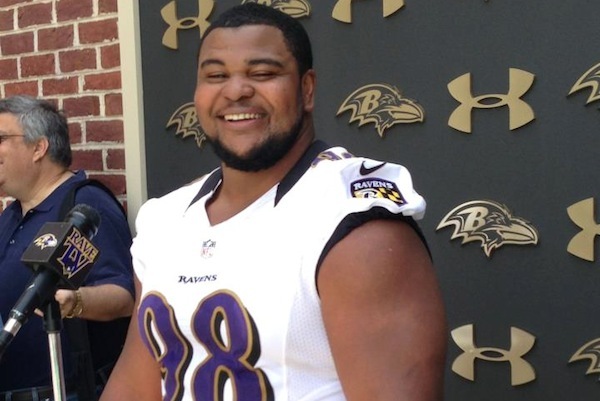 Jeremy Zuttah was brought in to solidify the center spot which will make Marshal Yanda better. That leaves right tackle as the only spot needing competition for Rick Wagner which may be sought after early in the upcoming draft. Furthermore, Gary Kubiak knows how to operate a high efficiency running game. Theoretically, the Ravens have made all the proper moves thus far to improve the 30th ranked rushing offense. It’s really all up to Pierce and Rice now to get this ball rolling again. Bernard Pierce likely to get the heaviest load right off the bat and if anything, a chance to show off his talents for other teams if the Ravens cannot retain him when he potentially becomes a free agent in a couple years. Or Pierce could show the Ravens he is ready to take over as the starter for good if Rice has another down year and faces a potential release in 2015 where his $9.5M in dead money at that point could be spread over two seasons to lighten the blow to the cap. For the rushing game to be successful once again, Bernard Pierce could be the most important player in need of a breakout season in 2014. Brandon Williams – Williams was drafted in the third round by the Ravens in 2013. Many who cover the game thought that the 6’1”, 335 pound monster out of Missouri Southern could step in and start alongside Haloti Ngata. That wouldn’t be the case as the “amoeba” 3-4 defense sported a front of Ngata, Chris Canty, and Arthur Jones most often. Williams saw playing time in seven games last season, picking up one sack. Otherwise, was scratched from the game day dress roster. Arthur Jones will be playing for the Colts in 2014 and that opens up a spot, potentially as a starter, that Williams can earn. The second year defensive tackle doesn’t have to worry about his strength. Videos surfaced on the Ravens website recently, showing Williams benching a ridiculous 525 pounds. Picture a weight bar with Joe Flacco sitting on one side and Dennis Pitta sitting on the other. That’s almost what Williams is benching. Andre the Giant weighed 520 pounds and the world went crazy when Hulk Hogan did the unthinkable and body slammed him. Okay, enough about Williams’ impressive strength. Strength is only half the battle. Technique is what Williams will need to perfect this summer if he hopes to earn a starting gig. Each of the last couple years, Haloti Ngata has been bothered by some nagging injuries. There was a knee that gave out in the Super Bowl, and once again caused him to miss a game midway through last year. If Ngata continues to be bothered by injuries, Brandon Williams is basically the only one around with the size and potential to fill in the nose tackle spot that Ngata occupies. Canty, Deangelo Tyson, Kapron Lewis-Moore, these guys don’t have the size to do it. If not Williams, we’re looking at Terrance Cody which can only mean the defense and run stoppers are in big trouble. One way to allow the linebackers not known for run defense, like Daryl Smith, to be able to get more of a free run at the ball carrier is for big men like Ngata and Williams to take up multiple blockers. Ngata does that all the time. Williams alongside him instead of Tyson, or Lewis-Moore, will create even more havoc up front. It also creates blockers the offense can use to block pass rushers like Canty, Terrell Suggs and Elvis Dumervil. Getting late game stops in the run game and sacks anytime in the pass game are two things that eluded the Ravens defense often in 2013. It all starts up front. For the battle in the trenches and an improved game changing defense, Brandon Williams could be the most important player in need of a breakout season in 2014. Arthur Brown – Brown was tagged unfairly as the guy drafted who would replace Ray Lewis, which can’t be done. The pressure was taken off the young man out of Kansas State when the Ravens signed veteran middle linebacker, Daryl Smith, coming off an injury in Jacksonville that sidelined him for most of 2012. The Jags all-time leading tackler was brought in to ease the transition, and to not allow a rookie in Brown to quarterback the defense which had a number of new pieces in place. It would take a special player to do that as a rookie. With all due respect to Brown, he was a second, almost third round pick. Not a top five draft pick. Not thought of as “special” by definition. Then again, there was a time when Ray Lewis wasn’t thought of a s “special” either. Most of Arthur Browns playing time came on sure passing downs with Josh Bynes and later Jameel McClain when he returned from a bruised spinal cord, getting the starting nods alongside Smith. Bynes is a Harbaugh kind of guy. He earned his way onto the team as an undrafted free agent in 2011. He went from practice squad, to doing work on special teams, to making the final tackle in the Super Bowl in 2012. Harbaugh felt Bynes deserved a shot at starting inside linebacker. Arthur Brown recovering from a sports hernia through camp, and appearing timid in the preseason because he was trying so hard not to screw up, didn’t help matters for his case much. As we saw in 2013, Josh Bynes and Daryl Smith are not great at stopping the run. Smith in fact is the league’s worst ILB at run defense. The door is open for Arthur Brown to elevate his game and be more than a coverage linebacker. The Ravens already have one of those in Smith. Brown did a lot of things right in his college days. Fundamentally sound tackler, physical, gets sideline to sideline, three-down motor, and all the other cliché titles like “gamer, instinctive, reliable, motivator, etc…” He’s got to put the rookie jitters behind him and beat out Josh Bynes, and other special teamers like Albert McClellan, and be the true number one linebacker here. Brown has got to improve in the read and react department. He’s got to be a run stopper and allow Daryl Smith as the coverage linebacker to be the compliment to him. Not the other way around if he wants to take his game and the Ravens defense to that next level. For the run defense to get back to the level where Ravens fans are used to seeing it, Arthur Brown could be the most important player in need of a breakout season in 2014.